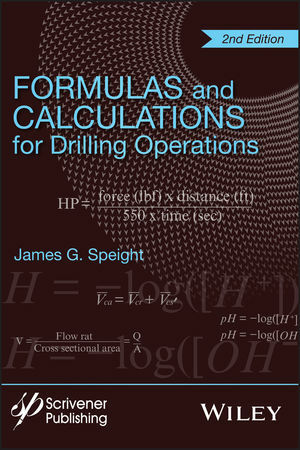 Presented in an easy-to-use format, this second edition of Formulas and Calculations for Drilling Operations is a quick reference for day-to-day work out on the rig. It also serves as a handy study guide for drilling and well control certification courses. Virtually all the mathematics required on a drilling rig is here in one convenient source, including formulas for pressure gradient, specific gravity, pump, output, annular velocity, buoyancy factor, and many other topics. Whether open on your desk, on the hood of your truck at the well, or on an offshore platform, this is the only book available that covers the gamut of the formulas and calculations for petroleum engineers that have been compiled over decades. Some of these formulas and calculations have been used for decades, while others are meant to help guide the engineer through some of the more recent breakthroughs in the industry’s technology, such as hydraulic fracturing and enhanced oil recovery. There is no other source for these useful formulas and calculations that is this thorough. An instant classic when the first edition was published, the much-improved revision is even better, offering new information not available in the first edition, making it as up-to-date as possible in book form. Truly a state-of-the-art masterpiece for the oil and gas industry, if there is only one book you buy to help you do your job, this is it! James G. Speight, PhD, has more than forty-five years of experience in energy, environmental science, and ethics. He is the author of more than sixty-five books in petroleum science, petroleum engineering, biomass and biofuels, and environmental sciences. Although he has always worked in private industry which focused on contract-based work, Dr. Speight has served as Adjunct Professor in the Department of Chemical and Fuels Engineering at the University of Utah and in the Departments of Chemistry and Chemical and Petroleum Engineering at the University of Wyoming. In addition, he was a Visiting Professor in the College of Science, University of Mosul, Iraq and has also been a Visiting Professor in Chemical Engineering at the University of Missouri-Columbia, the Technical University of Denmark, and the University of Trinidad and Tobago.